They round the barrels at breakneck speed, flying across the dirt for home in a matter of hoof-pounding seconds. They drive gooseneck horse trailers cross-country, sleeping above the truck bed and showering at truck stops. They muck stalls and toss hay at dawn and dusk, and stay up late with sick foals and their own children. When it’s showtime, they glam it up in crystal-encrusted pearl snap shirts and with hair teased so big it can barely hold a hat. Despite the difficulties, rodeo is a life worth living. But the rewards don’t come easy. To be successful at the sport, it takes a special blend of strength, bravery, and drive. Rising above the talented competition to really make a name for yourself requires something even more. Here are seven cowgirls who have an extra measure of that special quality we call … COWGIRL GRIT. 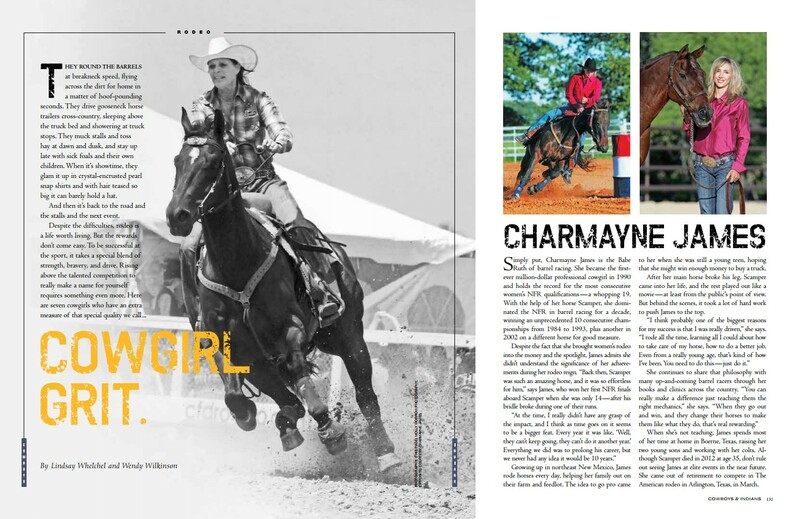 Simply put, Charmayne James is the Babe Ruth of barrel racing. She became the first-ever million-dollar professional cowgirl in 1990 and holds the record for the most consecutive women’s NFR qualifications — a whopping 19. With the help of her horse Scamper, she dominated the NFR in barrel racing for a decade, winning an unprecedented 10 consecutive championships from 1984 to 1993, plus another in 2002 on a different horse for good measure. When she’s not teaching, James spends most of her time at home in Boerne, Texas, raising her two young sons and working with her colts. Although Scamper died in 2012 at age 35, don’t rule out seeing James at elite events in the near future. She came out of retirement to compete in The American rodeo in Arlington, Texas, in March. 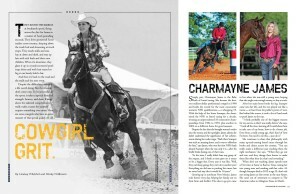 To read about the rest of the cowgirls featured in the November/December issue of Cowboys & Indians — on newsstands now! — visit www.cowboysindians.com.